A new exhibition at the Phillips Collection examines the relationship between the Neo-Impressionists and their Symbolist peers. 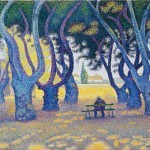 aul Signac, Place des Lices, St. Tropez, 1893, oil on canvas. Paul Signac, Setting Sun. Sardine Fishing. Adagio. Opus 221 from the series The Sea, The Boats, Concarneau, 1891, oil on canvas. 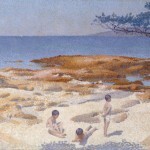 Henri-Edmond Cross, Beach at Cabasson (Baigne-Cul), 1891-92, oil on canvas. As Rood was publishing his theories, Michel Eugène Chevreul, a French chemist and thinker, was nearing the last decade of his life (he died in 1889 at the age of 102). Chevreul’s studies ran the gamut—he pioneered a formulation for soap using fats and salt; discovered margaric acid and creatine; explained the physical phenomena behind divining rods and magic pendulums. As director of the Gobelins tapestry factory in Paris he became aware that certain colored dyes looked different when next to others. Beginning in 1839, he started developing a 72-part color wheel that depicted three primary colors, red, blue and yellow; three secondary mixtures of orange, green and violet; and six further secondary color mixtures. The wheel showed that under certain circumstances the brain could perceive colors that aren’t there. Chevreul’s work led him to formulate the Law of Simultaneous Contrast, which eventually crossed over from the realm of pure science into that of art history. 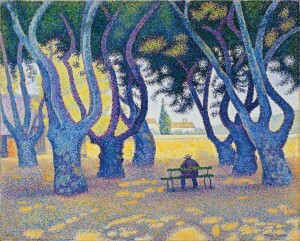 The scientific works of Chevreul, Rood, and others inspired Georges Seurat, Paul Signac, Camille Pissarro, and their fellow Neo-Impressionists to develop a particular style of color application known as mélange optique (optical mixture). While using the study of optics as the basis for their techniques, they could approach the thematic concerns of Impressionism from a new angle. Separating colors with individual strokes of pigment—a method Signac called Divisionism—the Neo-Impressionists attempted to trick the eye into perceiving a greater vibrancy of color emanating from the canvas. As Signac put it, “the separated elements will be reconstituted into brilliantly colored lights.” Divisionism doesn’t exactly replicate the way the eye and brain divide colors, so the intended illusion doesn’t quite come through. However it represents an important step in the evolution of color theory and modern art. Its pure aesthetic effect is vibrant and shimmering—like waking up from a dream within a dream. A new exhibition at the Phillips Collection in Washington, D.C. (September 27–January 11), titled “Neo-Impressionism and the Dream of Realities: Painting, Poetry, Music,” will feature more than 70 works and highlight 15 artists. Viewers will be immersed in the science and beauty of the group’s paintings just by looking at them. However, they will also be given a window into the cultural atmosphere surrounding these painters. The show will place its focus on the relationship between Neo-Impressionist painters and Symbolist writers. These two groups, which were working simultaneously, shared a social milieu as well as ideas. “Neo-Impressionist painters were close friends with Symbolist writers and discussed passionately how to express their ideas in poetry and painting,” says exhibition curator Cornelia Homburg. “The painters wanted to transform reality in order to evoke a mood or an emotional experience, rather than find a way to reproduce what they saw in front of them.” Similarly, the mission of the Symbolist movement was to depict absolute truths through indirect description. Symbolist poetry was an art of evocation rather than explanation. Painted the following year, in 1891, Signac’s Setting Sun. Sardine Fishing. Adagio. Opus 221 from the series The Sea, The Boats, Concarneau, which will be hung at the Phillips, though more placid in mood, shares the portrait’s principles. 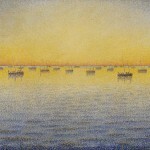 The lines and colors are very organized—as can be seen in the ripples of the sea and the boats dotting the horizon—yet there is a rhythmic, almost buzzing quality to the seascape because of the pointillist technique. Though it is a scene ripped from nature, it bears a decorative quality that is willfully divorced from reality. 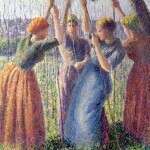 The painting, as suggested in its title, takes inspiration from music, as did many Neo-Impressionist works. An important aspect of the exhibition, the group’s relationship with theater, music, and performance, will be on display. Seurat’s At the Gaîté Rochechouart (Café-concert), circa 1887–88, depicts the orchestra pit, the conductor, and a female singer, arms raised in the midst of a performance. The scene is rendered in conté crayon and white gouache on buff laid paper. The textures of the media coupled with the paper mimic the effect of the pointillist technique though the scene is black and white. A mysterious haze seems to descend on the stage from a light in the top right corner, and the dark cast over the orchestra gives the illusion that it is vibrating with noise. Another 1887 work on paper by Seurat, Woman Singing in a Café Chantant, is also in the show. Seen from the side of the stage, the performer is in profile. As the lights glow, the scroll of the stand-up bass and the head of its player seem to be backlit. Using black and blue chalk, white and pink gouache, and pencil and brown ink on paper, Seurat gives the viewer the illusion of a nighttime buzz, without the hangover—all of the illusion with none of the consequences.